Located at 823 Whitehead St., just footsteps away from the historic Hemingway House, Moondog Café and Bakery offers locals and visitors alike a modern and affordable dining option close to Duval St. The trendy and modern dining hot spot offers indoor and outdoor seating. Sit inside and admire the hip artwork that covers the space or sit outside on their large open deck and take in the local sights and sounds. Take a load off from seeing the sights, sip a mimosa and people watch with some of Key West’s chickens. 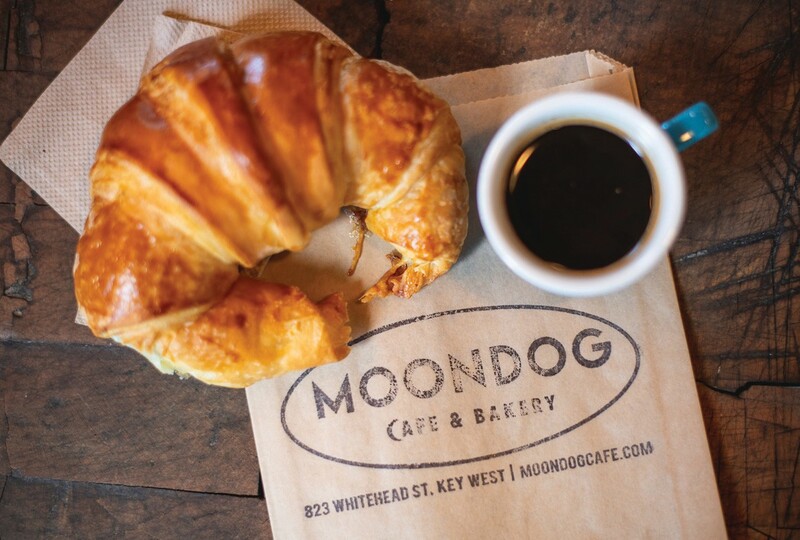 If you’re into brunch, Moondog is a must. Served daily from 8 a.m. to 4 p.m., their brunch menu offers an array of vegan, vegetarian, dairy-free and gluten-free options. Looking to pack on the calories and splurge? Then their Elvis French toast was made just for you. Made from their homemade banana bread, the Elvis French toast is layered in special house-made peanut butter with bacon bits piled on top with bananas. Maple-infused bourbon finishes off the dish, leaving you feeling decadent and rich. If you’re looking for a healthier breakfast option, try the Feel Good Bowl made with organic red and white quinoa, sautéed red onions, pepper, kale, mushrooms, avocados and pepitas. Add an egg, too, if you want to up the protein. You can also kick-start your day with one of their freshly made juices. Their refreshing cucumber, watermelon and lime juice is a must try after a morning spent strolling in Old Town. If juices aren’t your thing, surely you’ll find something to quench your thirst at their bar. They offer bloody Marys, mimosa, wines, Italian sodas and beers, just to name a few. The smoked salmon benedict is something to write home about, served with Norwegian smoked salmon and poached eggs on an English muffin piled on top with their luscious homemade caper and key lime hollandaise sauce. If breakfast isn’t your thing, not to worry — their eclectic menu offers everything from traditional eggs benedict, pizzas and salads to their fresh catch of the day. With a revolving door of daily specials and a fixed menu, Moondog is set to please even the pickiest eaters. Ravenous vegan and vegetarian customers are able to feed their hunger with various dining options. The avocado and veggie salad is the perfect blend of roasted beets, kale, shaved radish, grilled carrots, sprouts, pumpkin seeds and goddess dressing. Their share plates are a great starter to any meal or can be eaten alone as an entree. The fresh spinach and artichoke dish on the sharing menu is to die for. But be careful — one bite will make you want to devour the savory dish all on your own. The burgers at Moondog are served hot and big with a heaping side of fries or a salad. The Frenchman burger is cooked to perfection and loaded with brie, fried shallots, tomato jam and topped with fresh arugula. The burger varieties at Moondog are endless. When you enter the cool and trendy eatery, you’re greeted by an array of mouth-watering sweet treats. Feast your eyes on their homemade tartlets, cookies, baked breads and — my favorite — the strawberry lemonade cupcake. Forget about your diet and splurge on their decadent treats. You’ll walk it off later, trust me. Wash down your bake goods with one of their many delicious coffee beverages. They have everything from iced coffees and lattes to local favorite cafe con leches. Moondog’s dinner options are just as filling and tasty as their brunch selection. Sit outside on their lighted deck and enjoy dinner, served nightly from 4 p.m. until 10 p.m. Their heaping salads are filled with green goodness and are all served with housemade dressings. The Lobster Nicoise is a seafood lovers dream. Poached Florida lobster rests on top of nicoise olives, green beans, hardboiled eggs, potatoes, tomatoes and capers topped of with a balsamic vinaigrette. Taco lovers can choose from fish, steak, shrimp or tofu as fillers assembled in a soft corn tortilla. Choose from an array of delectable sandwiches and grilled pizzas for lunch or dinner. As you might expect, there’s nothing traditional about their pizzas. Order the Moroccan lamb pizza, loaded with spiced lamb, mozzarella, tzatziki, fresh tomato and tahini spread with mint — this pizza is a feast for the senses. Veggie lovers will go gaga for the grilled veggie and pesto pizza.